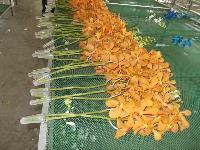 We are offering mokara dendrobium orchid with cotton and 20 stems in one bunch to india. one box = 800 stem. 20 to 22 kg per box. cnf india = 0.155 $ per stem for white cnf india = 0.158 $ per stem for pink minimum order quantity is 250 kg 9600 stem 12 boxes.